Supporters of the Tehreek-e-Labbaik Pakistan Islamist political party say a prayer after their leader Khadim Hussain Rizvi announced an end to their protest in Islamabad, Pakistan, Nov. 27, 2017. The party has called off new protests following an agreement with the government. Tehreek-e-Labbaik Pakistan (TLP), an Islamist political party, has called off its protest in Pakistan following an agreement with the government. The protest kicked off in early April in the eastern city of Lahore and continued for 12 consecutive days until late Thursday. Before reaching an agreement, the party warned the Pakistani government that it would arrange a series of demonstrations across the country if their demands were not met. Khadim Hussain Rizvi, center, leader of Tehreek-e-Labbaik Pakistan islamist political party, at their protest site in Islamabad, Pakistan, Nov. 27, 2017. TLP and the government reached an agreement last year after TLP staged a three-week protest in Islamabad that turned violent toward the end. An official from Punjab province told VOA that the government held rounds of negotiations with the Islamic cleric trying to get the group to end its protest. “Punjab government has had talks with Khadim Rizvi. We have tried to solve the matter as peacefully as we can,” Malik Ahmad Khan, the spokesperson for Punjab government told VOA. “Unfortunately, these people play with people’s religious sentiments and you know how sensitive the matter of finality of Prophet Mohammad is in Pakistan,” Khan added. Khan said government must try to find a permanent solution to these problems. “We need a permanent political solution for such situations and this should end for once and for all,” he said. FILE - A supporter of the Tehreek-e-Labbaik Pakistan, an Islamist political party, holds a sign, which reads in Urdu, "remove Zahid Hamid" during a sit-in protest along a main road in Karachi, Pakistan, Nov. 27, 2017. Thousands of TLP followers gathered in Islamabad last November and paralyzed the city for weeks. 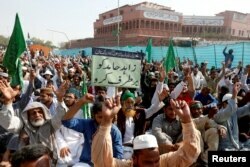 The protesters accused the government of committing blasphemy over modifying a parliamentary bill related to “Khatam-e-Nabbuwwat” oath that affirms the end of prophecy and Muhammad to be the last prophet. The efforts to disperse the protesters by security forces turned violent and led to a series of reactionary protests in different parts of Pakistan. In the end, the government accepted TLP’s demands following Pakistan’s military intervention to strike a deal between both sides. As part of the agreement, the government reportedly promised that criminal cases against Khadim Rizvi and his followers would be withdrawn, TLP’s arrested members would be released and the government would also release the findings of an investigative report related to the modification of the parliamentary bill on “Khatam-e-Nabuwwat” oath. The deal was dismissed last month after an anti-terrorism court in Islamabad declared Khadim Rizvi a fugitive and ordered the government to arrest him and present him before the court. The court is hearing three cases against Khadim Rizvi and his followers on charges of terrorism, violence and attacks on security forces during last year’s sit-in. 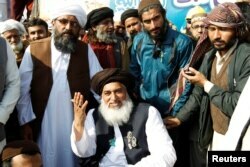 Despite his fugitive status, Rizvi lead a sit-in in Lahore for several days. “It’s an irony that the government, despite having a court order for Rizvi’s arrest, is not able to arrest him,” Punjab government spokesperson Khan said. On Rizvi’s orders, hundreds of TLP supporters occupied the roads leading to Lahore and vowed that the protest would continue until government agreed to their demands. Some analysts blame the government for its failure and inadequate actions against forces who play with religious sentiments in the country. “TLP will get what it wants because it is playing with religious sentiments in the country which is a highly sensitive matter in country like Pakistan. The government is afraid of them. The current government has a soft corner for right-winged religious parties,” said Hasan Askari Rizvi, a Lahore-based analyst said. TLP emerged last year in August and came into prominence after the Islamabad sit-in. Its leader Khadim Rizvi openly admires Mumtaz Qadri and vows to carry on his legacy through TLP. Mumtaz Qadri killed Salman Taseer, Punjab’s governor, in 2011 after Taseer demanded changes to country’s controversial blasphemy law. Qadri was apparently unhappy with Taseer’s stance and believed no changes should be made to the blasphemy law.